After that, select the kinds of conversions you want to track. To track sales and other options, select the Website option. Give a random Conversion name, select an appropriate category option. Here, we have selected the Purchase/Sale tag. Then check the radio boxes for suitable Value and Count options that meet your needs. After that, click on CREATE AND CONTINUE button. Login to WP Admin Dashboard → WooCommerce → Conversion Tracking. Then, turn the toggle button on to activate Google Adwords functionality. 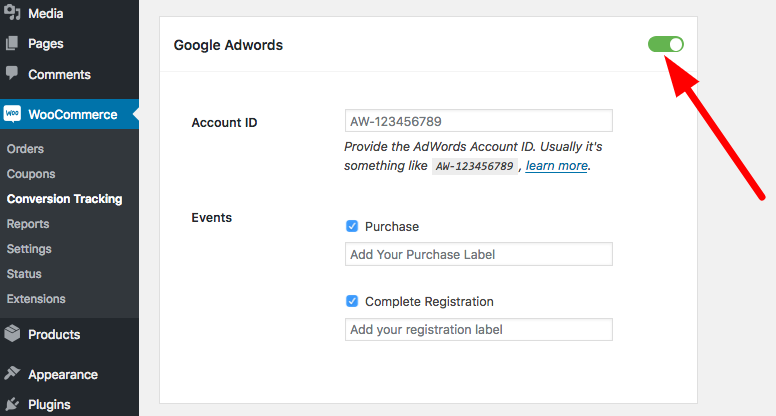 Now hit Save Changes button and you are done configuring Google AdWords Account ID!